Video is the medium that moves the world, and educators who keep up with technology shifts are preparing their students to achieve in an ever-evolving global landscape. The use of video and interactive technology is well established as a best practice in education, dating back to the days of TV display push carts. But with 65 percent of the population seen as visual learners, what began as a teaching aid is now indispensable to the education experience. Even as displays increase in size and resolution, they may not be reaching their full audience. In an average classroom, 57 percent of students cannot read content on a 70-inch flat panel, according to data from Radius Global Market Research. Clearly, the issue is one of scale. From classrooms to college lecture halls, the need for vibrant, impactful visuals that enhance the education experience is growing. Educators must be able to reach all students equally all the way to the back row. With high definition 1080p (and up to WUXGA) resolution and ultra short-throw projectors that can reproduce visuals greater than 100 inches from just inches away—even including intuitive finger touch models that turn a flat wall into an interactive experience—panel technology simply can’t stand up to the size, brightness and articulation offered by modern projection technology from leading brands like Optoma. For educators to fully invest in technology, it must be flexible, adaptable and cost effective. 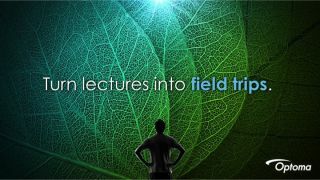 Optoma’s Education First program allows educators in every K-12 and higher education institution to enrich their classrooms, lecture halls and auditoriums with projection technology. Get up-close with Optoma projectors and visualize how projection can transform your classroom or lecture hall into a multimedia learning environment. This information sheet details how educators can take advantage of deep discounts, enhanced tech support, extended product warranties and even education-centric exclusives through the Optoma Education First program. Connection to Optoma’s HDCast Pro and Amazon FireTV via onboard HDMI, or to Google Chromecast through USB, puts Optoma projection at the front of edu-tainment tech. Optoma ultra short-throw projectors also feature multiple inputs and outputs, enhanced lamp life and a built-in speaker with a mounting system that’s quick and easy to install. Ready to Learn How Education First Can Help You? Visit Optoma online now to learn about the 4-3-2 Warranty and the four easy steps to getting onboard with Education First.